As the drive gets more than a few hours in, that's typically when the glow of the smartphones and devices isn't doing the trick, hunger sets in and the bickering in the back seats can begin. I don't know about the pilot of your ship, but my husband is a minimal stop kind of guy. On those rare stops, everyone quickly gets out, uses the facilities (whether they think they need to or not) and we quickly try and distract the kids from the convenience store treats they think they must have to endure the rest of the trip. So the key to a smooth ride is an organized vehicle where you can get to things really quickly and a few surprises you can provide along the way when everyone gets a little road weary. A few simple solutions can really make a difference and make the family road trip smooth sailing. 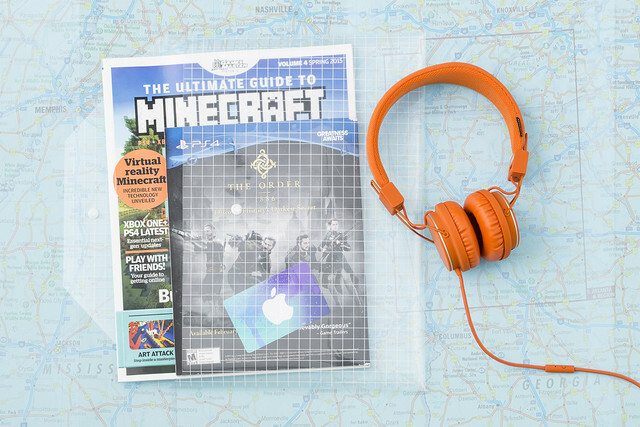 It's important that the driver's area stay free of clutter, and that frequently needed items such as maps and guidebooks are easily accessible. 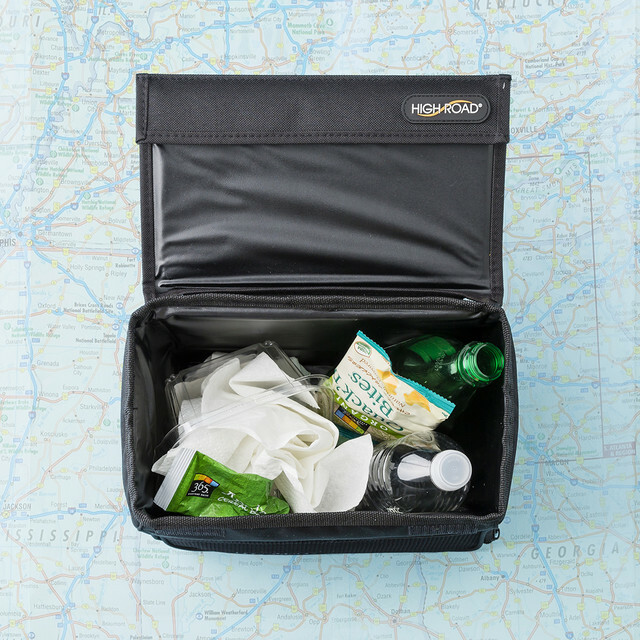 Choose cases to store these items that fit neatly in a glove box or side door pocket. Our Modular Hauler System is perfect for the trunk of your car or back of your SUV. 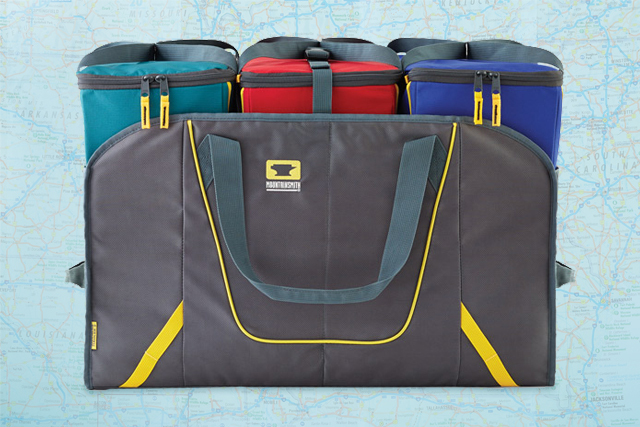 It includes one large compartment and three color-coded modular storage cases that fit inside. The cases are ideal for storing and sorting different types of gear or you can use them to organize by person - assign one case per family member to contain everyone's essentials. Each case is removable and features a zippered closure as well as a vinyl pocket for stowing smaller items. Packing outfits for each day of the trip keeps things orderly inside the suitcase. But what I love is that that they are great if you are going to break up a long road trip with a quick overnight hotel stay. Instead of having to unload the entire car and luggage, you take one out ahead of time for each child that includes an outfit and some PJs, throw in a few of their must have toiletries and you have the quick overnight bag that you can take into the hotel. 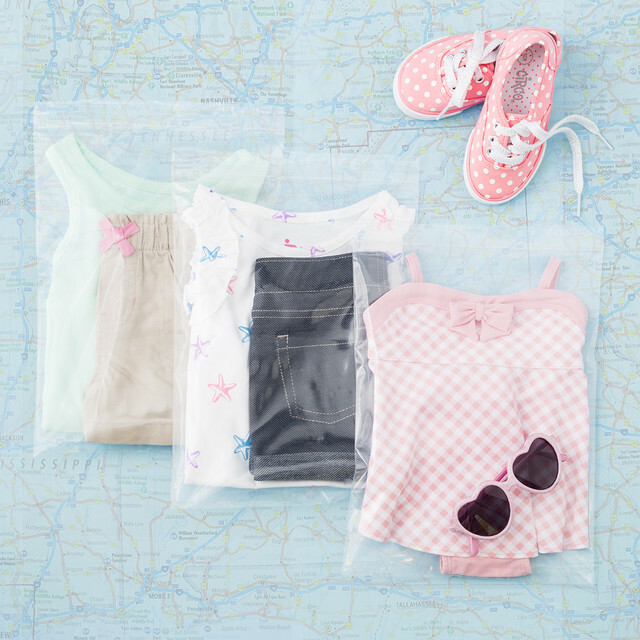 When the kids are younger, it's also smart to stash a few empty ones in the car to easily house soiled or wet garments or bibs until they can be brought in at your destination for washing. Again, to keep the whining and the stops to a minimum, pack a water bottle and individual snacks for each passenger. 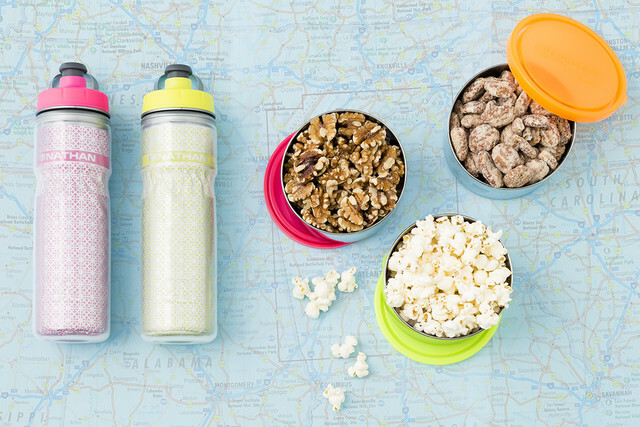 We love these stainless round containers that have colorful lids. Think about color-coding each snack pack for each kiddo. 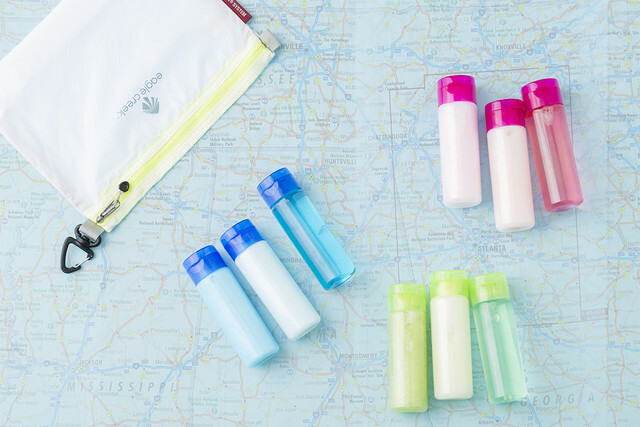 Pack a kit with supplies and other necessities like lotion, sunscreen, hand sanitizer, etc. You can, again, color-code those for each child. And then pack an on-the-go medicine cabinet that is always easy to access when you're traveling. Pack a small supply of bandages, pain reliever, stomach medicine, first aid ointment, sunscreen, hand sanitizer, stain removal pen and a small first aid and sewing kit. This has become a go-to necessity on every single trip. Sometimes toys and coloring books can take control of the interior of your car. We love the idea of packing up a "busy box" - plastic boxes that fit neatly beneath the seat or organizers that hang from the back of the seat for quick access. 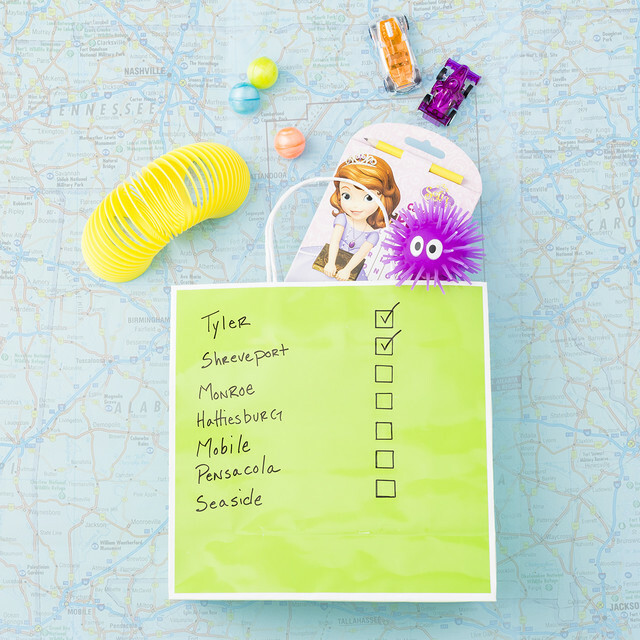 Let children label their own storage box with their name and stickers that reflect their personality. 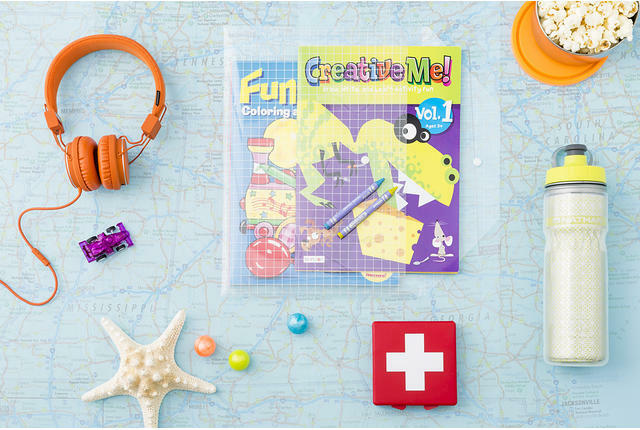 Clear plastic envelopes are great for corralling games, crafts and little projects that can be done from the passenger seats. I mentioned the devices. Yes they will be there. There have been years when I tried to ban them from the car ride, so that it was an electronics-free trip with deep conversations and long runs of the state license plate game or ‘I spy'. But for me, especially as the kids got older, it was just reality that everyone would have a device - including myself. 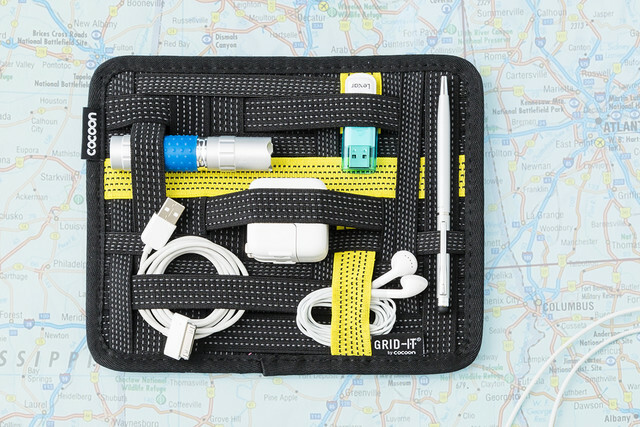 This Travel GRID-IT! Organizer features a multitude of rubberized elastic straps to keep items handy and in place, including chargers, ear buds and any number of other personal items. You can easily drop it inside a handbag, backpack, or tote. With four kids, I'm big on assigning each of them with their own organizer so they are responsible for their own stuff. Tuck a flashlight in each one so that they have a quick light when the drive goes into the night. Because the car can get messy and gross quickly, a travel-sized trashcan is a must have. We actually strategically place a couple in the SUV. Each time you stop to fill up with gas, simply empty the can of trash. Some surprises help break up the monotony of the trip. A great tip is to pack a bag to pull out just at the right time in the trip for each child. For younger kiddos it could be a game or book. For the older ones, an iTunes gift card for a road trip download works wonders. For everyone, a little sugar treat of their favorite candy will create smiles for miles. Our experts suggested this gift tote, and marked it with cities that would be driven through that are checked off for a fun activity. You can pull out a surprise each time you pass through the city or see the landmark.